Me in my new white dress. Ok I may not be Cinderella but I did go to the ball. The enjoyment of Scottish Country Dancing was rekindled for me this year after hearing an add on the radio for the Knox Scottish Country Dance Club. I was pleased to find the basic dancing skill were still there. 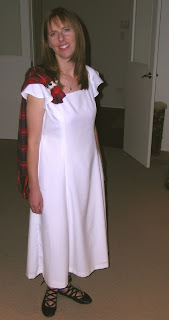 Mum helped me sew a white dress, (traditional formal dress for women) and I ordered a sash of the family tartan from Scotland. Off to the ball I went! I had a wonderful time and danced almost non stop for four hours! For those of you who know nothing about this type of dancing it's like a gym workout with a personal trainer. To prove that, for the next few days my legs were protesting every time I had to walk down stairs .